And much more! Please contact us to request a quote! For any job you may have, we have the staff and knowledge to support the custom fabrication of your project’s miscellaneous metals with proper documentation. Please consider using us for your custom fabrication needs for both your large and small jobs. We are here to serve you! We have a full time drafting team on staff to provide you with any large or small submittal package. 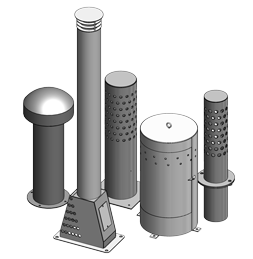 Custom bollards are built for either permanent or removable installations, and can be fabricated in any diameter and height. 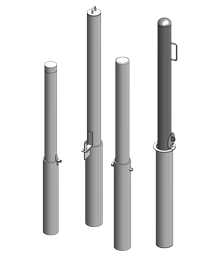 Bollards are available in bare, hot-dip galvanized, powder-coated. 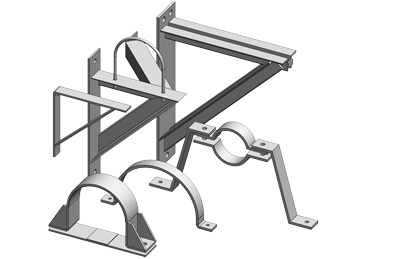 Fabricated brackets and straps to secure pipes in any position. Built to fit any diameter pipe and along any degree of the pipe circumference. Available in 304 or 316 stainless steel, mild steel, bare and hot-dip galvanized. Pedestal pipe supports provide a more secure support system than most adjustable supports. These are used to both support and control the movement of pipe and valve assemblies. 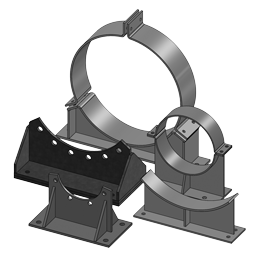 We have manufactured a wide variety of these supports to exact specifications. We can provide virtually any style support for a competitive price and a rapid production time. 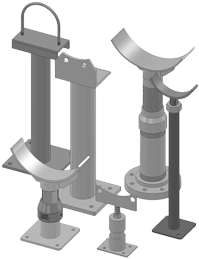 Pipe stands are available for all types of applications, such as flange mount, u-bolt top, saddle top or clamp top. 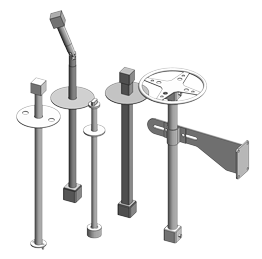 Pipe stands come ready to install, adjustable or fixed dimensions. We offer a large inventory of stock sizes in 304 or 316 stainless steel, mild steel, bare, hot-dipped galvanized and powder coated for any custom application. Valve assembly cages help to protect against theft and vandalism, yet allow for visual inspection of the valve structure. Custom designs and finishes are available. 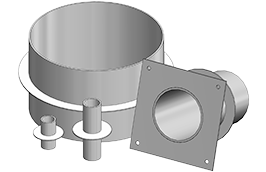 Our Valve Enclosures and Vents protect above-ground air and vacuum release valves and properly ventilate vaults. 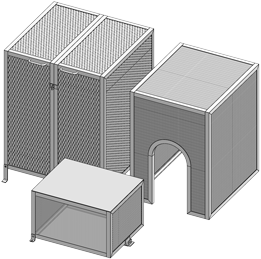 These enclosures, which are functional and stylish, can be custom fabricated to meet any specification. Coatings include hot-dip galvanized or zinc-rich powder coat. Valve stem extensions and wall bracket guide arms are made to order. Fabrication can be made from mild steel, 304 or 316 stainless steel. We also offer various finishes, such as hot-dip galvanized and powder coated. Pipeline Products provides built-to-order wall sleeves for wall penetrations and pass-throughs. Our standard sleeves are 12″ long with a 1/4″ x 2″ weep rings, but custom lengths, diameters and weep ring sizes can be built on demand. Hot dipped galvanized and polyester powdercoat finishes available. Pipeline Products © 2017 All Rights Reserved. Designed by Jewel Web & Design.